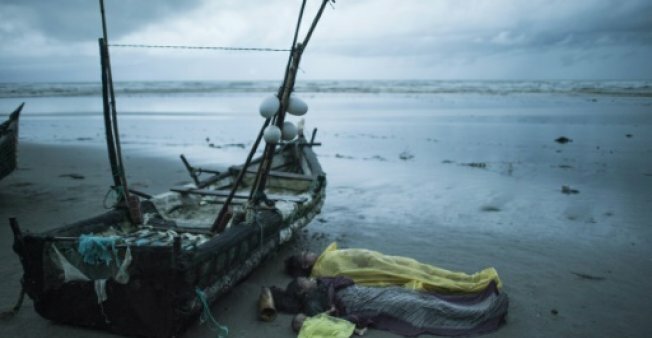 At least 19 people drowned with scores more feared dead when a boat carrying Rohingya families capsized off Bangladesh. COX'S BAZAR (BANGLADESH) - UN chief Antonio Guterres exhorted Myanmar's leaders to end the "nightmare" faced by Rohingya refugees fleeing an army campaign, after at least 19 people drowned with scores more feared dead when a boat carrying Rohingya families capsized off Bangladesh. More than half a million Rohingya Muslims have poured into Bangladesh in the last month, fleeing a vicious Myanmar military crackdown on Rohingya rebels that has gutted villages across northern Rakhine state. Scores have drowned while trying to cross waters separating the two countries, while those who survive face new dangers as they cram into squalid refugee settlements where food and clean water are in short supply. The billowing humanitarian crisis prompted the UN Security Council to hold its first meeting on Myanmar in eight years, though the member countries failed to arrive at a joint resolution. The US slammed the army for trying "to cleanse the country of an ethnic minority", while Beijing and Moscow offered support to Myanmar authorities who have vehemently rebuffed allegations that ethnic cleansing is underway. "The situation has spiralled into the world's fastest developing refugee emergency, a humanitarian and human rights nightmare," he said, while calling for those displaced from the conflict to be allowed to return home. The UN chief noted that the "systemic violence" could cause unrest to spill south to the central part of Myanmar's Rakhine state, threatening 250,000 Muslims with displacement. Some of the strongest criticism came from US envoy Nikki Haley, who accused Myanmar authorities of waging a "brutal, sustained campaign to cleanse the country of an ethnic minority". "It should shame senior Burmese leaders who have sacrificed so much for an open, democratic Burma," she added, in what appeared to be a rebuke to the country's civilian leader Aung San Suu Kyi, whose reputation as a human rights champion has been battered by the crisis. "We must be very careful when we talk about ethnic cleansing and genocide," added Russian ambassador Vassily Nebenzia, taking the Myanmar government line as he blamed Rohingya militants for "burning villages". Fires have razed hundreds of communities in northern Rakhine over the past month, in what rights groups say is an army-led effort to drive out the stateless minority that has faced decades of persecution. Myanmar, a mainly Buddhist country, has denied the allegation and defended its operations as a proportionate crackdown on the Rohingya militants whose deadly raids on police posts on August 25 sparked the military backlash. Witnesses and survivors said the vessel that overturned Thursday was just metres from the coast in rough waters, after it was lashed by torrential rain and high winds. There are fears the death toll could rise sharply with the International Organization for Migration saying about 100 people, mainly children, were believed aboard the downed vessel. The bodies of 16 people -- mostly children -- were found Thursday and brought to a local school, said coastguard commander Nasir Uddin. Two more bodies of young boys were retrieved Friday morning, he added, while another woman was washed ashore in a separate location. "The boat hit something underground as it came close to the beach. Then it overturned," said Nurus Salam, who had set off for Bangladesh from a coastal village in Myanmar late Wednesday with his family. UN chief Antonio Guterres exhorted Myanmar's leaders to end the "nightmare" faced by Rohingya refugees fleeing an army campaign, after at least 19 people drowned with scores more feared dead when a boat carrying Rohingya families capsized off Bangladesh.